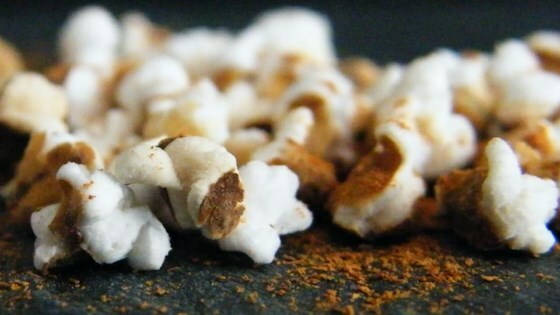 "Popped sorghum is an earthy spin on popcorn. Sprinkle cinnamon and sugar onto the freshly popped sorghum for a sweet treat." Pour sorghum into a small brown paper bag and fold shut. Microwave on High until the majority of sorghum is popped, 1 to 1 1/2 minutes. Transfer popped sorghum into a bowl and drizzle with canola oil; sprinkle with sugar and cinnamon. Toss to coat. This was a surprisingly tasty afternoon snack! Popped sorghum looks like mini popcorn! Update: I made this again for a party, and tried just cinnamon. Delicious!